I have been a fan of Panasonic wet/dry electric shavers for many years. Just in time for the holidays, Panasonic came out with their latest and greatest (and priciest) shaver, the Arc5, Model ES-LV65s. I treated myself to one for Christmas. The two main new features of this device are a motor that keeps a constant speed when it encounters a tough stretch of beard, and a foil that has tapered holes. And yes, this is indeed the best shave yet for me from a Panasonic razor. 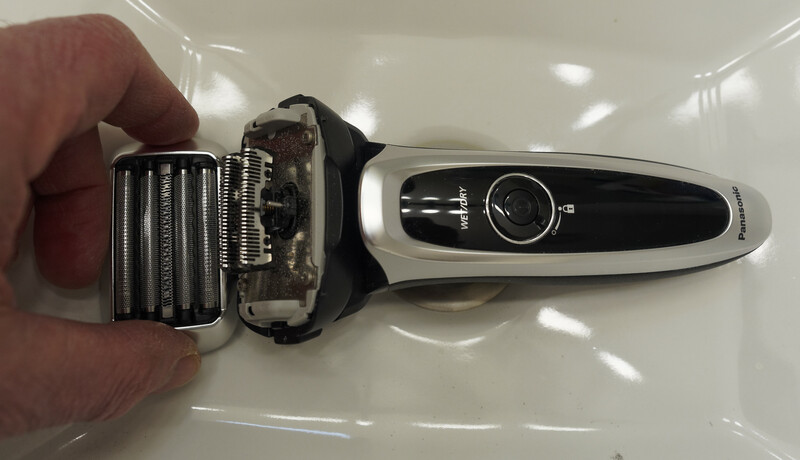 There is a trick to getting a close shave from any of the newish Panasonic razors. Some years ago, they changed the blade design from vertical (with respect to the foil) to horizontal. The latter makes it possible to shape the blade edge (30° on the Arc5) to get a better shave. However, the downside is that there is a large horizontal area to allow cut off hairs to be between the blade and the foil, causing a gap. This makes getting a really close shave impossible. The trick to remediating this is to do a pass over your whole face, and then to "bang out" the cut hairs from both the body part and the head part. This works well on all previous models because the head part has roughly parallel sides. But as you can see in the above image, the Arc5 has steeply-sloped sides with no place to grip, and when you "bang out" the head, chances are that your hand will slip off the head and hit and dent the very pricey ($72) foil. As I did. The damaged area is pointed to by the A in the Arc logo.